San Francisco State University and Pacific Gas and Electric on Thursday dedicated a new fuel cell plant that will generate clean power for the utility's electricity grid -- and lower the University's heating costs. SF State is working collaboratively with PG&E, which will own and operate the plant. The demonstration project was approved by the California Public Utilities Commission and includes the construction of fuel cell facilities on several California State University and University of California campuses. "For SF State, this fuel cell plant represents the latest step in our longstanding and comprehensive commitment to sustainability," President Robert A. Corrigan said at Thursday's dedication ceremony. "Four years ago, when the American College and University Presidents' Climate Commitment was launched, this campus was one of the first to sign on. I knew that we were being asked to set ambitious goals for ourselves, but I had no doubt that we had the heart and the talent to do it." The plant consists of two fuel cell systems and technologies that generate a total of 1,600 kilowatts or 1.6 megawatts of electrical power connected directly to PG&E's local distribution grid -- enough to power about 1,200 homes. SF State invested $550,000 to connect the fuel cell plant with the campus's heating infrastructure. The waste heat captured from the fuel cell system is used to heat campus buildings. The University will earn back its investment through an estimated $250,000 in annual savings from lower heating costs. There are educational benefits as well. Corrigan noted the University has built sustainability into its academic life and a growing number of classes from a wide range of disciplines focus on the topic. "Appropriately, this fuel cell plant will itself become a research and learning center for our faculty and students," Corrigan said. For more information about the fuel cell project, visit http://www.sfsu.edu/~build/construct/fuelcell.htm. 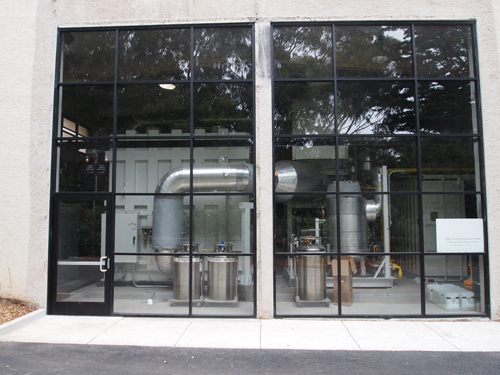 The dedication of the new fuel cell plant at SF State on Dec. 8. 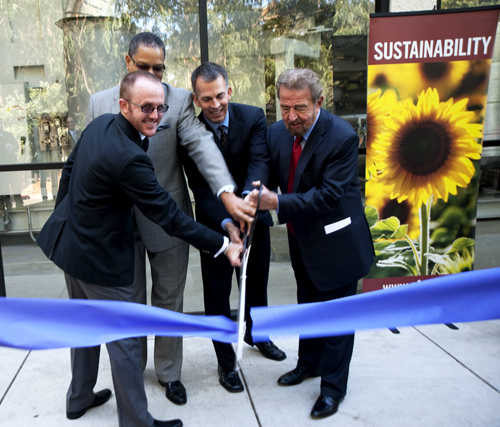 From left: Wes Morgan, energy programs manager for the CSU, Timothy Alan Simon, California PUC commissioner, Scott Loveless, manager of renewable resource development at PG&E, and SF State President Robert A. Corrigan. Credit: Gino DeGrandis. Front view of the fuel cell plant, located north of the Gymnasium. 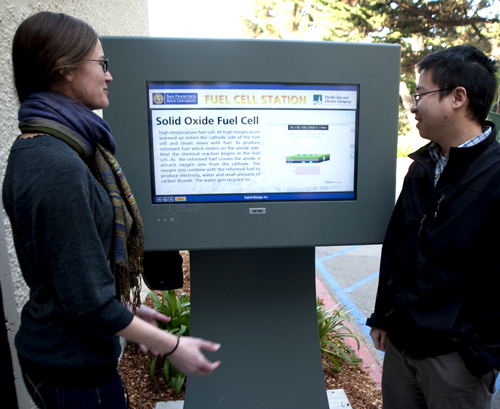 Students from the Engineering Department demonstrate the educational touch-screen kiosk outside the fuel cell plant. The audio-visual presentation explains how fuel cells generate electricity. 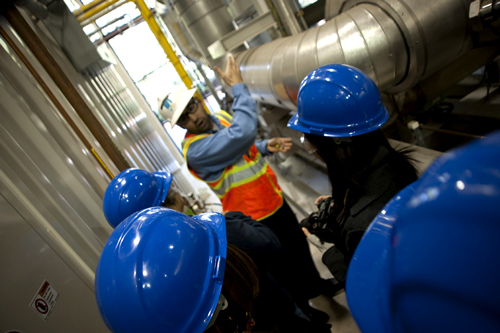 A staff member from PG&E shows visitors the inside of the fuel cell plant during a dedication ceremony on Dec. 8.